Take a stroll back over the previous century. Below are links to some of the very best nostalgia and memories sites on the Net! You'll be reminded of those magical moments of your youth and yesteryear. Be reminded of the fads, culture and happenings from many of the the past decades. It is my hope that your mind will be flooded with nostalgia and memories as you wonder back to memory lane. These sites are sure to bring up memories and stories that you’ll want to tell. Old Time Radio Catalog - Old time radio encompassing radio recordings made usually between the mid 1920's through 1960. This "golden age of radio" included all genres of amazing recordings which were frequently performed live by top name performers. Play them on most MP3 devices! Fibber McGee and Molly, Dragnet and Gun Smoke are just a few of the old radio discussion forums that are on this web site! If you're not old enough to remember them, your parents or grandparents will! 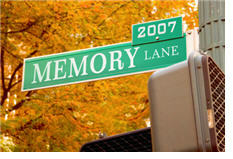 Stop and Remember Your Past - A great article and poem that anyone born in the and around the "nifty" fifties will enjoy! Tihs site will give you a great dose of nostaliga and memories. History of the 20th Century - Decade by Decade - A great resource to reminisce and recall events from each decade. Historical events can act as triggers to stories that you may have locked away in your memory banks. Old Vehicles Here's a cool web site that is sure to send you thinking back, recalling and reminiscing about all the vehicles you or your family has owned over the years. Many of our memories are associated with the vehicles that we had at a particular time in our lives. Warning: Adjust your computer speakers, as this site has a background song that plays!. Don't let it startle you. Also, see if you can find your old lunchbox at this nostalgia site!